THIS ITEM IS NOT AVAILABLE AT PRESENT. WE WILL NOT BE GETTING ANYMORE Star Wars Classic Mr. Potato Heads Wave 1 Case. From the Star Wars collection by Hasbro. Star Wars Classic Mr. Potato Heads Wave 1 Case. 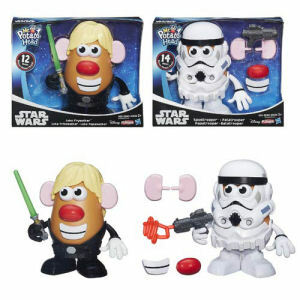 Case includes 2 individually packaged potato figures 1 Luke Frywalker and 1 Spudtrooper Each measures roughly 7.5 inches tall. Hasbro Star Wars Figurines shipping from Canada. No Surprise Border fees or Customs!